Cynthia Moss, a former journalist and present director of the Amboseli Elephant Research Project in Kenya, has studied the same population of elephants for 47 years. Born 1940 in Ossining, New York, U.S.A. While visiting Lake Manyara National Park in Tanzania 1967, she met leading elephant researcher Dr. Iain Douglas-Hamilton in Tanzania. In 1968 she quit her job at "Newsweek" to work with Iain Douglas-Hamilton. In 1972, she started the now famous Amboseli Elephant Research Project at Amboseli National Park in Kenya. Since then (47 years) she and her research associates have identified and recorded more than 1,400 elephants belonging to 50 families at an immense of 400 square miles. When asked who has been most influential in her life Moss answered, "Oh, Echo I think." 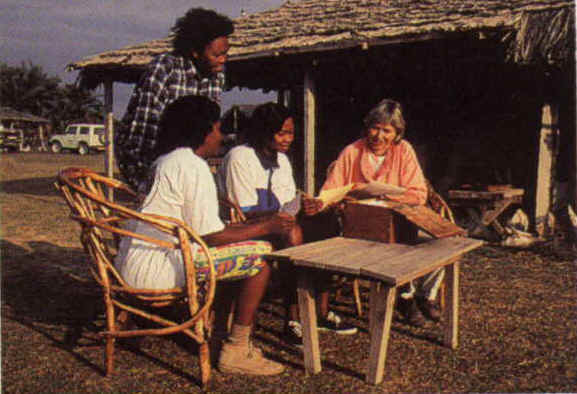 Research assistants Norah Njiraini, Soila Sayialel and Katito Sayialel with Cynthia Moss.